Dot (. )bd& Dot (. )বাংলা is a Country Code Top Level Domain (ccTLD) in the Internet. It is the address of Bangladesh in the internet world. BTCL is the registration authority of both ccTLD on behalf of MoPTTT. Any person, organization from all over the world can register a .bd domain and it takes atleast 3 or 4 working days to active the domain. 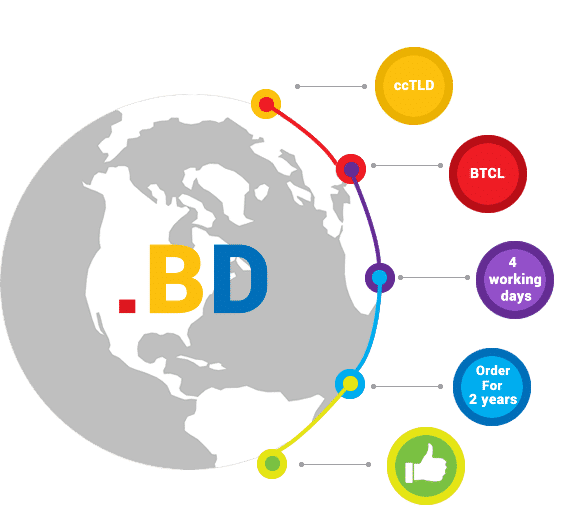 BD domain can be registered for 2 years or more you want. Now it is easy for everyone to register a .bd domain through online. Registrations are at the third level beneath several second-level labels, paralleling the oldest gTLDs; registration is open except in the gov and mil subdomains, which are limited to authorized entities in the Bangladesh government. There is no online registration facility available for .bd domains right now. It’s a top class chance for anyone to start a successful journey by registering .bd domain. Users can purchase .bd domain from our site at BDT 1250/= (per year). Also users can purchase any shared web hosting packages, reseller hosting packages, dedicated hosting packages and much more things which it required to host a website. .bd.education Education Bangladeshi Students only. .বাংলা Any Organizations or individuals. .বাংলা (“bangla”) is a second country code top-level domain that was granted for Bangladesh in 2011.This domain is meant for web addresses in the Bengali language. The process of assigning domain names for web sites has not started as of 2014.